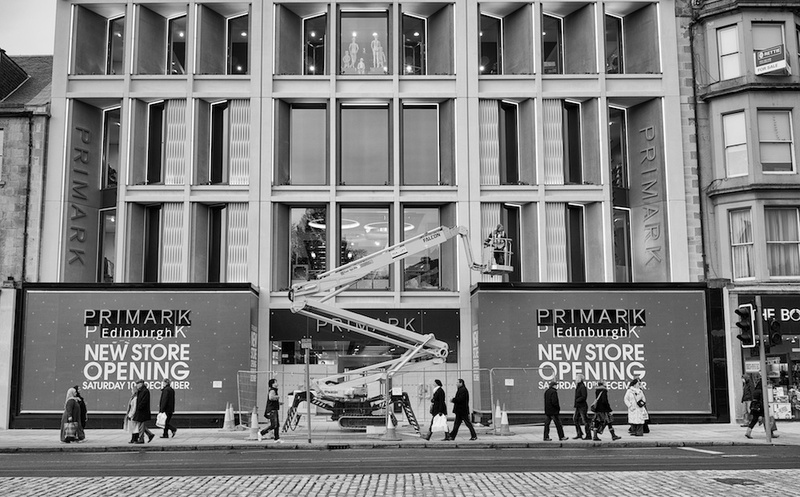 It’s a sign of the times that the most glamorous part of Edinburgh’s main shopping street in the lead up to Christmas is the new Primark cut-price clothing shop. It’s as if all the other shops have just given up. t least the building looks nice. It is so sad that Princes st. is such a shithole. If only it were more like George st. – it really should be, we would then at least have a main town center that doesn’t lead to embarrassment. Funny … here in the states smaller malls are popping up with open spaces and a Main Street type of feel. Even NYC is closing parts of streets and putting bike lanes and tables to sit down in. Although Princes Street is supposedly the main shopping street in Edinburgh, apart from the Jenners (“Scottish Harrods”) department store, is is full of cheap Scottish souvenir shops to trap the tourists. The parallel George Street is by contrast, really nice and classy. I’ll try and get some photos of it when I am in tomorrow, as the decorations are great. Primark is hell in Oxford Street, London. You will be tempted to go in, but I warn you now; you may never come out. You fight for clothes in there.